Former England Under-21 international player who became the striker for the Scottish Championship club Rangers in 2015 after playing one season with Wigan Athletic. He made 59 appearances while signed with Leicester City on a permanent deal between 2010 and 2014, but was loaned out to Hull City, Millwall and Wigan Athletic in those years as well. He was brought up through the Sunderland youth system between 1998 and 2007, joining Sunderland's main club from 2007 to 2010. He was loaned to Charlton Athletic and Leicester City during those years, appearing in 43 games for Leicester City in 2009-2010 before signing with them permanently. He was named the Leicester City Young Player of the Year for the 2009-2010 season. 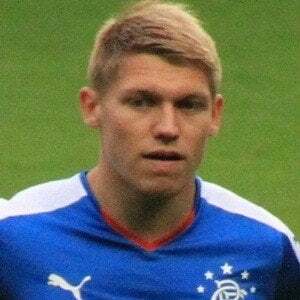 He was born Martyn Thomas Waghorn in South Shields, England. He is a father. He scored on a header after a cross by Alex Oxlade-Chamberlain in an international game against Israel.